I have had over forty years experience in the music industry, working behind artists such as Johnny O’Keefe, John Farnham, Russell Morris, Normie Rowe and Ronnie Burns. As well I have played solo and been a member of numerous bands. I was a member of “Wallis and Matilda” during which time we were awarded a platinum album, for "Pioneers" a tribute to Banjo Patterson. As a songwriter, twice reaching the finals of the Tamworth Country Music Awards, and winning the 1989 - 3CCC FM Songwriting competition. In 2000, won The Henry Lawson Songwriting Competition. I sing, play five string banjo, bass,electric and acoustic guitar. 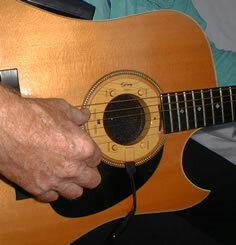 Playing acoustic guitar in our band Crosswind we play outdoor roving work where power is not available and when playing solos I could not be heard above the band a Double Bass, Washboard and another acoustic guitar. I needed something that would boost my sound and allow complete freedom to rove about and not carry a portable amplifier around and be able to turn on when needed! My first effort was 12 years ago, a piece of board with 2 speakers and an amplifier, wedged into my guitar. It sort of worked ok, enough to inspire me further . I have no knowledge of electronics it was a case of buying the kits and putting together. My next effort I made from a downlight which I modified, I was happy with this and was not going any further, until people wanted to buy one. The triton foundation helped me with my first model, I had amplifiers built professionally until I finally had the finished prototype and had it manufactured. 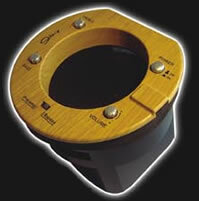 SHamp is now patented in USA and sold here in music stores and on line on this website.